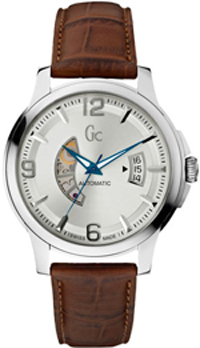 Gc is the new men's watches Classica Automatic.The novelty has appeared in a collection of Gc Classica. Elegant watch with a true masculine character combines exceptional attention to detail while not ordinary interpretation of vintage items. For example, one can observe the work of an automatic mechanism through the notch on the dial, made in the shape of a crescent, as well as through the transparent back cover. 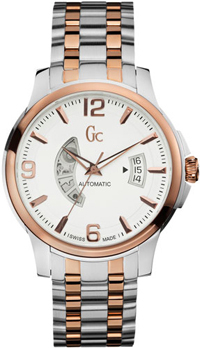 New differs refined Swiss design and classic conservatism, which in combination creates a unique style of Gc. Elegant round shell with a diameter of 42 mm was created with an eye to the vintage style. Cuts on the face of the crescent-shaped in the perfect position nine in the balanced window through which the date is visible in the position of three hours. Index of tips in the form of arrows, large Arabic numerals and hands the original form of coated SuperLuminova ®, combined with a textured dial – all these attractive, retro-classic. Hours Classica Automatic feature finely machined winding crown logo Gc and a transparent back with sapphire glass. The dial is also protected by anti-reflective sapphire crystal. Water-resistant to 100 meters (10 ATM). The range includes a variety of colors, materials and textures: polished body, matte black PVD-coated, or a combination of steel casing coated in pink gold. As for the strap or bracelet, it may be of Italian leather with embossed crocodile or steel.